As we near the end of January thoughts start to turn towards the 2019 season, something not so far off as I thought when I realised the ballot date for the first few events of the season is February 5th! Tim and Jonelle plan to head down to Vejer de la Frontera for the Sunshine Tour again this year with some 16 horses to keep them occupied. Lets hope that it is more sunshine than downpour this year as last year was a bit of a washout for sure. Those horses will leave around the 6th of February so Tim and Jonelle have returned from NZ and hit the ground running! Next week sees the start of Squad Training in the UK as well so it really is feeling like a whole new year all over again. And there really is plenty to look forward to with both of them having a fabulous mixture of youngsters and old friends with which to compete. The five star winners ( I know, most confusing but everything that was 1, 2, 3 or 4 star last year has been upgraded a stage to allow for a new 1 star level to come into place) have their own unique club and Classic Moet ( Molly), Wesko ( Dash), Faerie Dianimo ( Maggie May) and Ringwood Sky Boy ( Ozzie) are without doubt the stable superstars and will all be contesting 5 stars again this year. Joining that elite group with 5 star experience already under their belt will be Xavier Faer ( Hugo) who was 3rd at Badminton and and Bango ( Uno) who finished 2018 with a top 10 Burghley placing and a gallop round the main ring in Ozzie’s place whilst Ozzie gratefully shot out of the limelight and headed quick smart back to the stables! 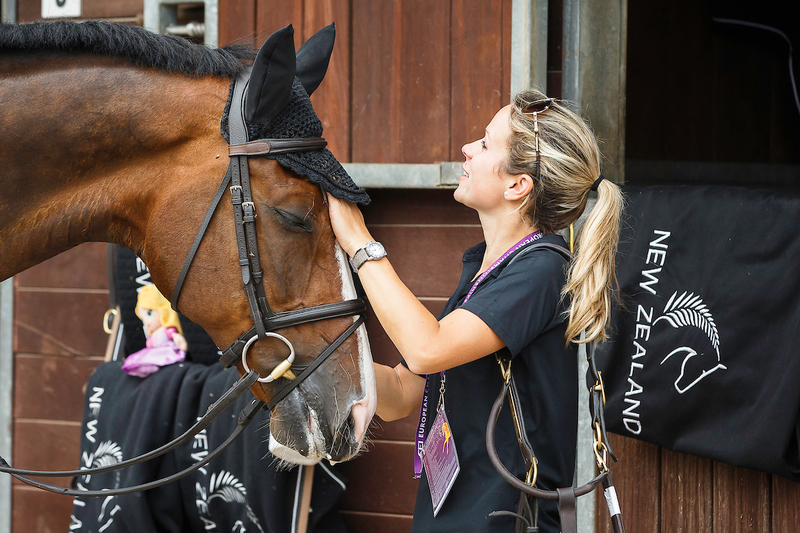 Four star winners Cekatinka ( Tinka) ( and World Equestrian Games best Kiwi horse in 2018) and Ascona M ( Ava) will be back for more while the other advanced horses that share a substantial amount of experience like Cloud Dancer ( Marley) and Cooley Showtime ( Eddie) will be back out causing trouble and making us laugh with their strong personalities. Falco stepped up to advanced last year with Tim and will be adding more experience this year with plenty to be excited about. Hester rose up to advanced on points last season with her win at Camphire CCI 2 star and will continue her ascendancy with Jonelle this year. Grappa Nera ( Grape) narrowly avoided the transfer list with a sudden understanding of dressage at the latter end of 2018 and looks to be a rival to Hester in the points list this time round. Tim and Spartaco ( Spartacus) looked all set to win Lignieres CCI 2 star until a nasty cut took them out of contention for the showjumping and they will looking to continue that form this spring. Happy Boy is on his usual cheeky brat form and will keep owners Susan Lamb and Therese Miller entertained as he starts to move on up through the grades and no doubt picks up some more tricks along the way. Faerie Magnifico ( George) is the grand old age of 6 this season and he has just received his FEI Passport so he can join the grown ups in Vejer de la Frontera with Jonelle and pick up some tips from his half brother Hugo. George is a bit smarter than Hugo and takes after his half sister Faerie Dianimo ( Maggie May) more so in both size and brain power so it will be interesting to see how he handles his first trip overseas. As for the new faces we will be looking forward to seeing another mare join Tim’s team as Senza Fine has left her native Italy and will be starting her 8 year old career from Mere Farm and Jo Preston-Hunt and Therese Miller will be following her journey with their usual enthusiasm. Jonelle’s ride, Curly Girl, did make just one appearance with her right at the end of the season with a runner up spot at Dauntsey 100 and that was enough to spark long term owner Lucy Sangster’s interest with a half share purchase. Curly Girl may not have the most stunning name choice but she does have masses of ability which is actually far more important! Another young horse to join Jonelle is Emotion ( Emma) and she has been produced by eventing royalty Holly Woodhead and Kevin McNab who both did some 100’s with her before Kevin casually dropped her into a couple of CIC 1 stars! Eventing First PLC own Emma and no doubt her baptism by fire will continue with Jonelle in the saddle. Lime Rickey joins Jonelle’s string as an intermediate that has been produced by Ginny Turnbull and Samantha Hobbs. Owned and bred by Constance Edmunson, Rickey is by a TB stallion and looks to be a lovely addition to the team. Clara M is another mare who will be ridden by Jonelle in 2019. Owned by Linda Penfold, Clara is well into advanced points and has been produced by Jonty Evans who, as we know, is now continuing his rehabilitation following his freak accident at Tattersalls last spring. Totally Cooley (TC) is actually a boy joining Jonelle’s team! He is just 5 so will start his eventing career in 2019 and he is owned by Jo Pidduck and the Andre Buthe Equine Clinic. I am pretty sure it is the first time that Jonelle’s rides number more than Tim’s but then it is only January and who knows who might be deciding to give their horse one more shot eventing themselves before they send it to Tim in March! Long term owners (and good friends), new owners, both old and new members of the Mere Farm team make up the crew for 2019. We waved a sad goodbye to Holly Fitzgerald as she returned to NZ before Christmas with thanks for the incredible hard work she put into 2018 and the fun along the way. Back up rider Amanda Brieditis ( SWEDEN) has also departed after quite a few years to set up her own yard with partner Rafael Losano (BRAZIL) and her position has been filled by Kiwi Tayla Mason who is planning on bringing a couple of horses over from NZ to join her. And talking of new faces…. no sooner has Otis Price started sauntering into the tack room on his own two pegs do we hear of another new face for 2019. No, its not quite the news you think but it is equally exciting… Yard Manager, Lucy Miles, who became engaged to her boyfriend last year, has announced that she is pregnant with their first child which is due in July. Lucy, as we all know, is such an integral part of Mere Farm and as Jonelle has said in the past, ” leads by example” with her dedication, knowledge, integrity and downright hard work. Lucy is pretty determined to be there at Badminton and to hold onto her position after that! I have no doubts that Lucy will bring up another Mere Farm baby right alongside her pet Wesko ( Dash) and that they will all be the best of friends. January Blues? Nah…. we don’t have time for that round here! Rock on February and rock on 2019!